As you relax at Nirarta, or attune to the ‘Way of Unfolding’ in a seminar or retreat, the sights, sounds, and smells of the grounds and their surroundings naturally bring you into harmony with the unfolding rhythms of life. 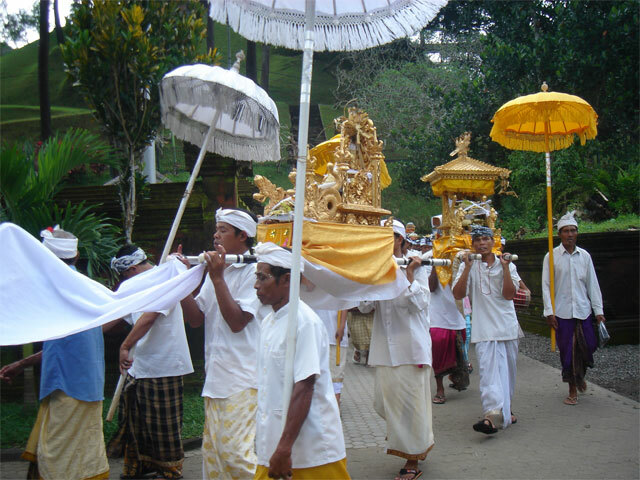 At Nirarta, you can experience the elusive essence of Balinese life, whether sitting in the dining area and simply absorbing the natural setting from which this astonishing culture emerged, or visiting one of the many ceremonies, which punctuate the unfolding rhythm of the Balinese calendar. 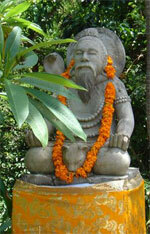 Balinese philosophy emphasizes harmony between one’s own ‘small world’ and the wider world around us. Such harmony is essential for flowing with the unfolding patterns of life. At Nirarta, it is easy to enter this flow and learn how to make it part of one’s life at home. Nirarta is set in a lush river valley of terraced-rice fields by tree-clad hills straddled by the imposing presence of the sacred mountain, Gunung Agung to the east of Bali. The views and atmosphere are breathtaking. Many a visitor are moved to tears arriving here. The nearest village is called Tabola. 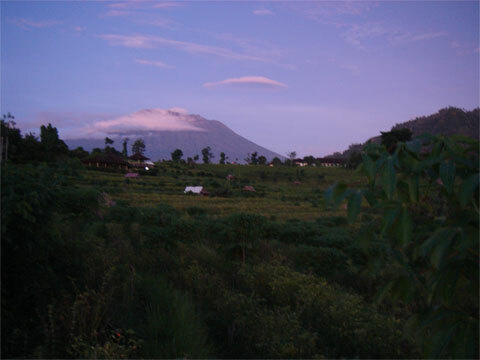 Tabola lies between Nirarta and Sidemen, a short walk from Nirarta. Sidemen is a medium-sized market village, with a few shops, including a telecommunications centre. Both Tabola and Sidemen are primarily weaving and farming villages, relatively untouched by tourism. The climate is always pleasantly warm, but rather cooler than the coastal plain. Nirarta has 11 guest rooms in six bungalows, each with delightful views. The bungalows offer a choice of accommodation to suit different tastes and budgets. Photos and full details of our accommodation here. View the facilities available during your stay at Nirarta. The wonderful dining experience, the gardens, the river. Check your travel needs, what to bring, and other practicalities to prepare for your stay at Nirarta. If you wish to bring a group, or have us host your seminar or programme at Nirarta. Share our journey in this stroll through the past - the place, the vocation and the family.